✅ Trip Verified | Zero stars if I could rate that low. We sat in the runway for 35-45 minutes after arrival from Barbados - the reasoning because of “other aircraft that needed to taxi”. Go ahead and start the stop watch. We needed to make a connecting flight to Richmond, and we only had an hour to get to our other aircraft. Well 35 minutes wasted sitting in the runway. Thank you either aircraft controllers or American Airlines. Once we were off the plane (another 10 minutes after waiting on the runway ) we made our way through one customs line where literally 500 hundred people were waiting. We waited in customs for another hour - at this point our plane had already started boarding for Richmond. After making it through the customs checks, there were 6 other customs officers sitting around talking and laughing (twiddling their thumbs) Maybe they could have helped open up more lanes in customs? No - poor management. To add on top of all of this, the one line was full of Miami residents that did not need to make a connecting flight. Maybe they could have opened up a different line for solely connecting flights? No - poor management. After customs we then had to pick up our luggage at baggage claim and recheck our luggage! I get this was American Airlines however this was another wasted 30 minutes. After all of this was said and done all but one American line was open so our so called “pre-check passes were useless “After talking with a behind the counter representative from American, they would not reimburse us for a hotel or could they guarantee a seat in the next flight to Richmond. 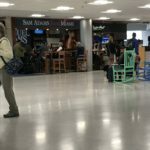 After staying the night in Miami on our expense, we arrived to our gate and American Airlines informed us only seat was available and that my wife could go ahead while I had to wait for another flight 10 hours later. But guess what? This was not a guaranteed seat either. Looks like I’ll be staying in Miami until the I purchase my own set of tickets again. All in all, this was a nightmare that the airport or American Airlines did not want to admit to their poorly planned schematics of arrivals and connecting flights. Hands down the worst flying experience I have ever encountered. - thank you TSA, Customs and American Airlines for ruining my trip. You can check me off your list of being a returning customer. I hope 1000s will read this so they can be forewarned of possible miseries. Something that could have been completely avoided if Miami knew how to run an airport. Not Verified | Overall this airport is great. Bright, clean and friendly. The terminal is very easy to get around. No issues connecting flights or getting related information. "a little bit dirty and uncomfortable"
✅ Trip Verified | Not a very good airport - nothing special. It's big, but a little bit dirty and uncomfortable. Crowded lounges, not many places to sit, strange DutyFree with taxes and the shops are the same. A little note: when you arrive, passport control will be very fast - because machines check the passports of any country, and when you leave the USA, you don't need to pass thru the passport control. ✅ Trip Verified | Dreadful airport. Security staff were ignorant, impatient and rude. My teenage children felt harassed and chastised during the security process even though they followed orders. The instructions weren’t written or clear and the process was long winded and stressful. We heard the security lady complaining about people being impatient but felt this was totally inappropriate in the circumstances. We are currently sat in the admirals lounge in the flagship area for Oneworld passengers and the service and food are disappointing. The body language of the staff is not good (shaking heads and huffing at guests etc) and overall this airport is definitely not one we want to return to in a hurry. "worst airport in the modern world"
✅ Trip Verified | The worst airport I’ve ever had to navigate. We had a 3 hours layover where we were coming in from London. 1. Air traffic control had us circle for 20 minutes. Ok, that happens. 2. Once we landed we were stuck on the tarmac for 40 minutes due to another plane not having docked correctly? and lack of communication regarding which gates the preceding planes were to be at. This doesn’t really happen much, so it was frustrating. 3. We had to go through two different rounds of security screening before having to pick up our checked bags. At the first one, even though we’re had the mobile passport completed, there was no line for mobile passport and with 6 kiosks only 2 were open; one exclusively for crew and global entry with the other for everyone else. 4. We had to then collect our luggage, which took another 30 minutes, to be randomly selected to have them rummage through our things. 5. Once they unfolded everything and left it a mess we were dismissed and sent towards the exit. We then had to recheck our bags at the airline desk which was on a different level and a long way away. Luckily, an airline staff member allowed us to skip the line and simply drop the bags. This was the one person who was helpful; airline staff. 6. Next we had to go through airport security again, however, this time it was the same security you go through if you were just arriving to the airport. Keep in mind we had just gotten off of an airplane here at the airport. Once in the line we got to hurry up and wait while 6 TSA employees condescendingly yelled at everyone. Nothing helpful from them, just threats to slow the line if their power-trip-orders weren’t obeyed. If someone failed to zip up their backpack before sending it through the scanner, instead of asking them to zip it, the person was chastised in front of the crowd. 7. The line of travelers constantly growing while the Walmart approach (having many registers with only one open) was adopted by the TSA staff. One screening conveyor belt was in use while 3 others were closed. With the exception of the lady who was running the conveyor belt, who would not make eye contact with anyone even when asked why my sealed clear bag from the duty free store back in a London was set aside. Nope, my duty free items needed to be taken out and run through another scanner. 8. What was the rest of the TSA staff doing? Literally walking around in circles not know who was supposed to do what. I heard “hey, who is on this one?” And “I though so and so was supposed to be here still” along with other statements that really reassured me our safety was the priority and was being handled by professionals. 9. We were reassured that once through this last “security” check that the gate was literally just up another escalator. Nope. Next we had to jump on yet another shuttle. 10. What’s the best part of this whole experience. The arrival gate (e24) was in the same terminal as the departure gate (e31). All of that fuss was to go through customs. In short, this is the worst airport in the modern world to deal with and I will gladly pay more to fly through another airport in the future so that I can avoid this from happening again. ✅ Trip Verified | Oh dear no. An awful experience. When you stand in a queue for an hour and 15 minutes with no access to a toilet and nowhere to sit it leaves a bad taste. I have to remind myself as meander like I’m in a queue at Disney that we are meant to be in the most advanced 1st world country on earth. I mean the citizens of this country landed men on the moon 50 years ago and sent satellites to the furthest edges of our solar system yet they can’t efficiently push people through airport arrivals. So after an hour and 15 minutes in a queue we were put into an area of robotic machines by semi robotic staff. One must put the four fingers of one hand on a glass plate on the machine, feed their passport into a slot and look at a light for the machine to take your photograph as if you are facing prison. The machine then spits out a paper ticket with your photo and passport details. In our case although the ticket told us to proceed out one of the semi robotic staff put us to another darn queue. This one took another 45 minutes and when we got to the counter we got to do it all over again. That’s to say, fingerprinted, photographed and passport examined. So what moron thinks it’s a good idea to push hundreds of people to machines only to then put them to human beings to do the exact same thing all over again? Insane duplication and a complete waste of time. I think the Germans call this verschlimmbesserung. So two hours with no access to water, toilet or a seat and to make matters much much worse was that whenever airline crew arrived they got preference over us to go through immigration with no consideration for the fact we’d been standing for hours. When I arrived at the airport I had a lot of sympathy for the folks working here because with the 21st century reincarnation of PT Barnum in the White House they weren’t getting paid but by the time I was standing an hour I felt I wouldn’t pay them either. 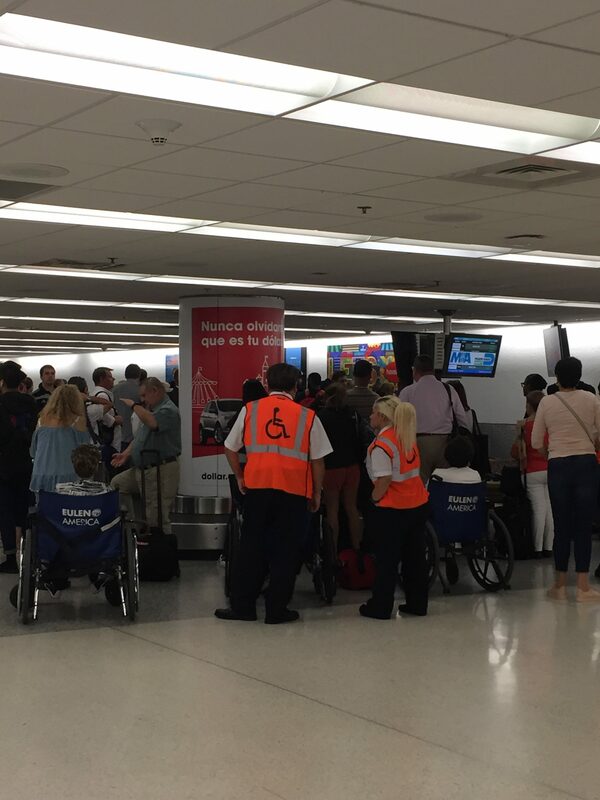 Barnum may be on capitol hill but arrivals at Miami airport was a horrible circus all of its own. Not Verified | We have had to connect through MIA several times in the last year to other destinations. 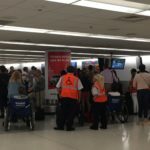 As we are frequent travelers, not much gets to us as we have been through a lot until it came to going through MIA several times. This is by far the worst, unfriendly, unhelpful and delayed airport we have ever experienced. Our decision after the last layover is that we will never ever go through MIA again. They are in desperate need of serious customer service training for all employees from bathroom personnel to ticket counter agents and everyone in between that you will come in contact with. Good luck! "airport is not very customer friendly"
Not Verified | The airport is not very customer friendly. I was to go to Terminal E for both trips through Miami and I must say the E is clearly the reject terminal. It’s disconnected from the main terminal and plenty hard to get to. Even with the train, it’s still an awkward and seemingly unnecessary drag of a walk. I’d consider myself an able-bodied, active and healthy young woman but I can only imagine being a passenger who needs more time and assistance to make it from point A to B. Terminal E (the reject) has the worst food and store accommodations I have ever seen. There is very little variety and no real restaurants. It’s pretty pathetic. 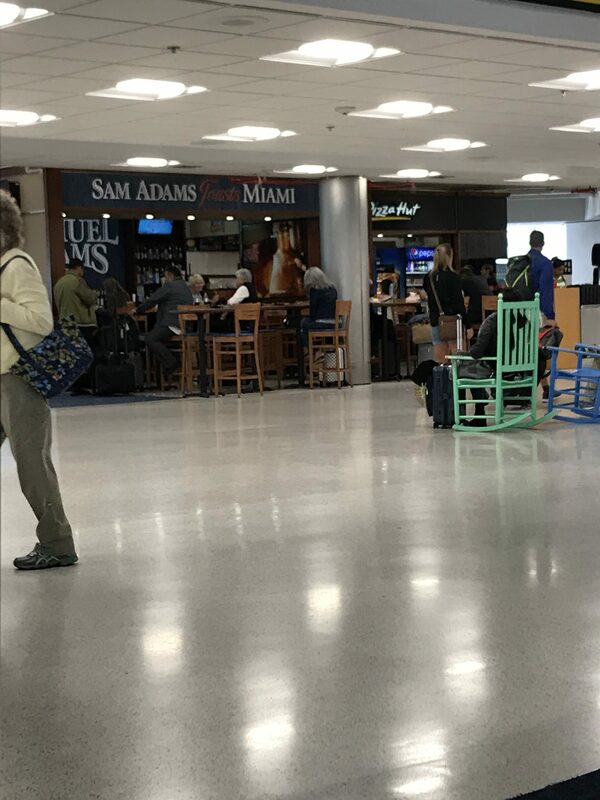 If I hadn’t spent all that trouble trying to get to E, I would have doubled back to eat in D.
"not impressed with the experience"
Not Verified | My husband and I flew into the Miami airport on Saturday, December 1 to connect with a cruise that was sailing that day. 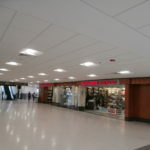 Our time in the airport was minimal as we were able to quickly locate the transfer service to the port and we were on our way in a short time. On Saturday, December 8 we returned to the Miami airport to await our return flight to Toronto. We arrived at the airport about 9.30 am and our flight was not until 2.00 pm so we had 4.5 hours to spend at the airport and we were not impressed with the experience. Upon getting off the transfer bus, we were directed to an outdoor counter to check our bags. This counter had minimal protection from the weather and we would have been quite uncomfortable if it had been raining or if we had been there mid-day in the hot sun. As others have mentioned, the cost of simple drink and snack options is extremely expensive. Several outlets did not even post prices but just a menu with a list of options. 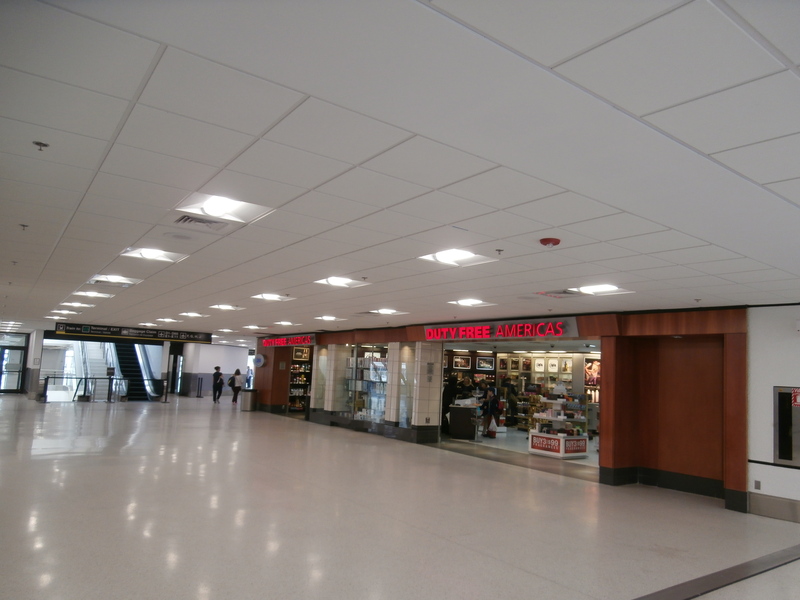 We settled on a coke, coffee and sandwich from the Starbucks outlet situated near gate D32. This location was convenient, well staffed and very clean. The major disappointment concerned the overall unkept state of the airport. There was a lot of garbage blowing around the waiting area where we checked our bags. The washrooms were filthy and the paper towel dispensers were empty. There were plenty of garbage cans but they were overflowing with trash.